Logical drive (volume) scan results view displays all files detected after a logical drive scan. Show or hide left-sided navigation tree pane. To toggle this option use Layout > Drive Navigator menu from view's toolbar. This control is used to filter files in scan result. 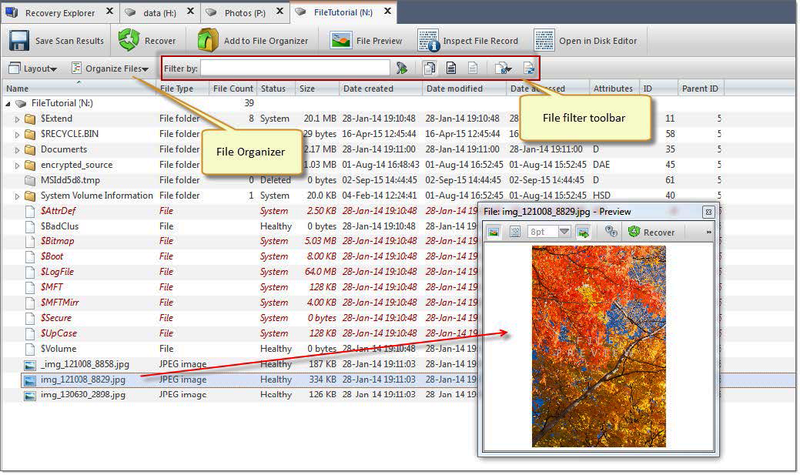 Read File filter toolbar control for usage information. If volume contains too many files or location of required files is unknown use Search for deleted files and folders feature — more advanced way to find files by their attributes and name patterns then simple filtering of contents of a scan. Search results will be shown in separate tabbed view and files can be recovered directly from search result as well. File Organizer can be used to collect files from different sources (scans) in one hierarchical collection and recovered in one batch applied the same recovering attributes for all selected file, like naming convention or file attributes. Repeat these commands if necessary for the same or for different file sources (scan results). Tip: It is recommended to save scan results for later use.